Digging Dolls: 1 lb Tumbled Amethyst Stones from Madagascar - 0.75" to 1.50" Avg. - Exceptional Quality Rocks for Crafts, Art, Crystal Healing, Wicca, Reiki and More! | Fountain City Art Ctr. 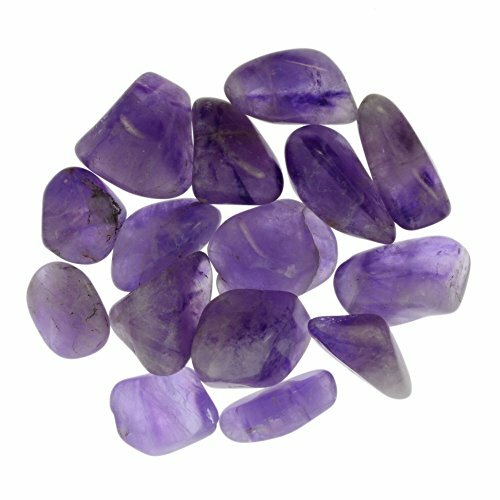 We have hand selected the rough Amethyst and tumbled it to bring out the vibrant purple color of each stone. These breathtaking stones are captivating and can be used for arts, crafts, home decor, decoration, tumbling, gem mining, fountains, wire wrapping, jewelry making, reiki and more. Once you have the stones in your hands the innovative thoughts for their uses just spring to mind! About Digging Dolls Stone Pictures: To ensure your satisfaction all Digging Dolls images show random stones right out of the mine bags. We have noticed many other stone dealers hand select and picture only perfect stones then what is received is not at all close to what is pictured. We believe in letting you see the most accurate representation of the stones you are ordering possible (short of taking pictures of every bag which would be cost prohibitive). Due to this some stones in our pictures may not look flawless, since as natural earth mined stones they are very rarely ever flawless. Every stone is unique and you will not be receiving the exact stones in the pictures. As natural earth mined stones that formed over millions of years they will vary in size, color, shape and patterning. The most important thing to Digging Dolls is making sure our customers are thrilled with what they receive when ordering the Digging Dolls brand. Please Note: These are natural earth mined stones that have been polished. Due to the nature of some material types find some imperfections in the stones including: flaws, pits, divots and cracks even after polishing has been completed. Our image shows the stones directly from the mine bag, we do not hand select the best pieces for our pictures. Each stone is unique and yours will be similar to the stones in our image. Includes only the authentic Digging Dolls brand of stones - as our mascot Ruby says, "We get our hands dirty... so you don't have to!"